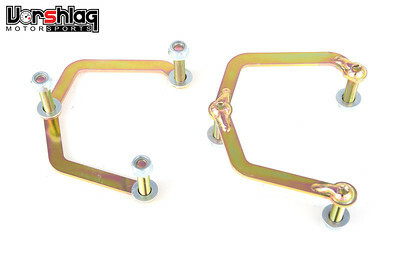 These bolt rings made to work with Vorshlag E46 and E46 M3 camber plates. This is made for Vorshlag camber plate users that strip the bolt ring studs studs by over-torquing them (the recommended 16 ft lbs tightening torque is just past hand tight). 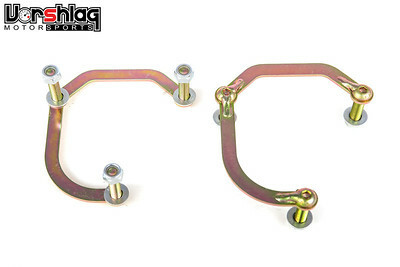 This replacement set includes both left and right side assemblies, new locking top nuts (nylock nuts) and new washers. These bolt rings start with a laser cut piece of plate which is placed on a large aluminum welding fixture. Next, each specified bolt is torqued to each bolt ring, then the bolt head is welded to the laser cut piece. After cooling each bolt ring assembly is unbolted, cleaned, acid dipped, and then electroplated with a Zinc Chromate finish for long life. Made in USA by Vorshlag. Here's a Tip: Don't torque past 16 ft lbs and they will outlast the car.